1). Basically, I'm using my BASE controller alongside an APC40, but I'm not using the remote script for Base, I'm using it as a simple MIDI controller so that I can take advantage of all the LED lighting and using Live 9's MIDI learn to map all the FX I need that way. Experiencing a weird issue when I try to map the left 16 pads on my controller to various FX I have in live (BeaT repeat On/Off). Since they just need to be in On/Off states essentially, I tried enabling toggle for each of those pads in the web editor (by the way I've tried using Mac and Windows, same result). No matter what I try though, I can only seem to get them to work in momentary mode (even when that mode is disabled). Whenever I have been able to get the pads to work in somewhat of a toggle mode, whenever I map an On/Off button in Ableton to a pad, I have to hit the pad like 4 times to enact a toggle, twice to turn it on, and twice to turn it off. 2) Minor issue, but the RGB controls for pads/faders seems to be backwards or inverted, i.e. R=blue, B=red, etc. 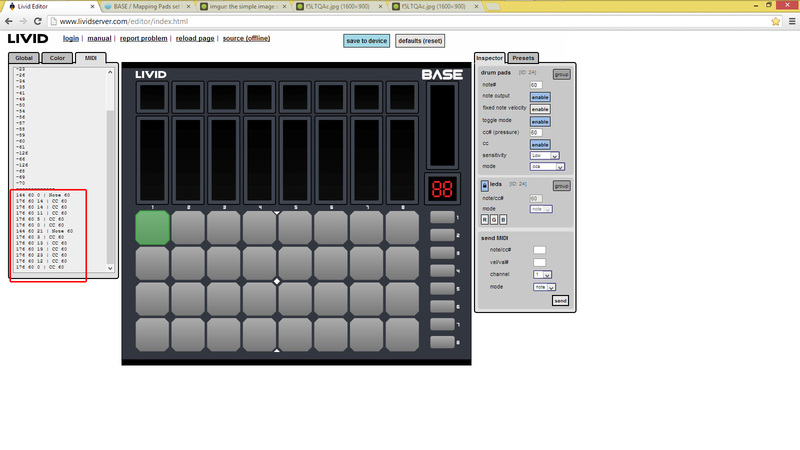 I'm using the web-based editor, and I have the most recent firmware for BASE, 1.3. Hey Jay, no I'm not using any Remote Script for Base, just utilizing it as a standard MIDI controller and using Live's MIDI Learn to map my effects (i.e. the left half rows of pads are used for beat repeats, the right-hand side is used as a standard 16-grid pad for drums/sampler, I've got my bank selector buttons mapped to an Instrument Rack chain selector range, etc). In the editor, I've also set my global channel to something other than 1 to try and avoid a bunch of conflicts with my APC40 that I'm using in tandem. I'm doing it this way to take advantage of the LEDs on the BASE without having to resort to User Mode, which doesn't allow me use of the LEDs, and also to avoid MIDI conflicts with my APC40. The red and blue being switched probably means that you have the wrong firmware. There is a batch 1 and batch 2 version. Try the opposite of what you are currently running. As for the toggle mode problem, it sounds like there may be some double triggering happening. I'm not positive, but maybe you are turning the note on and off very quickly so you see it as nothing happening. Can you download a MIDI monitoring program or use the midi monitor in the editor? Then you can view the actual midi data and see what is happening when you press a button. In toggle mode, you should get a single note on the first time you press a pad, then a single note off the next time you press it. Let us know your results and we can go from there. Hey Mark, yeah on the website you have two options for selecting your firmware based on date, and I had purchased my BASE through Guitar Center after that date I think, but who knows when Guitar Center actually got it and had it sitting in their warehouse. Anyways, I just used the Original Firmware and that fixed my LED issue. Still having issues with the pad toggle though. It looks like it's sending a Note value along with a range of CCs, which, I'm not sure if that's normal behavior or not. I should ask, should I be setting these pads to Note or CCs mode? I'm guessing Note, since there should be a Note On/Note Off sent from Base, right? 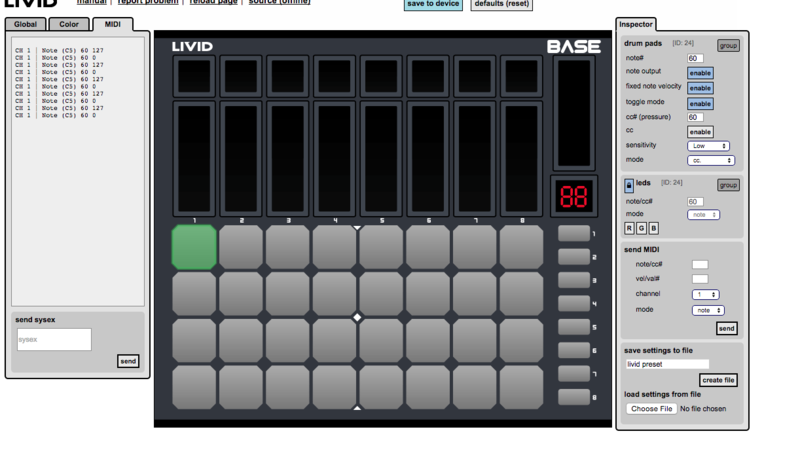 I've attached a screenshot with the MIDI feedback from within the editor along with the setting of the pad. This screenshot was taken on my Windows 8 system, but the issue seems to be the same on Mac as well. That is normal to send note on, then cc messages, then note off(momentary). If you are in toggle mode, then the note off shouldn't come until the next time you press the button. Can you verify if it is doing a note off when you release or the next time you press it? The cc's that come after you press the button are for after touch and pressure sensitivity. You can disable them, or map them to an effect like beat repeat. So is it possible then that when I use Live's MIDI learn to map an On/Off button to a Beat Repeat Device in Ableton that it's actually getting mapped to a CC message that happens after the note on/off? How can I disable that? I just want to be able to hit the pad once to activate the Beat Repeat, and then hit it a second time to turn it off. Right now, whenever I've been able to get it to map successfully in a toggle-like fashion, I've had to hit it 4 times to get that effect, twice to turn it on, twice to turn it off, and that's no good for me. You can turn the CC's off in the editor. Look for "cc enable". You can also turn "drum pad local control" on which will give you an LED indicator. Try turning on the "fixed velocity" that will make the velocity 127 each time which will always turn on the device. I think before if you were register velocity under 64 it would not turn the control on. Okay, so I seem to have it working now after a bit of testing. The odd thing is that I had to make sure that Toggle Mode is NOT enabled for the pads that I'm wanting to MIDI Map with Live's MIDI learn. That seems counter-intuitive to me, unless I'm mistaken as to the purpose of Toggle Mode on the pads? But yeah, now with CCs Enabled turned OFF and Fixed Velocity turned on like you said, it's just sending a Note On and a Note Off, two hits, one to turn On, one to turn Off, as I expect/want it to for what I'm trying to do. One nice update for the future online editor, and it's my understanding that this isn't really possible at the moment with the current online editor, would be to have LED "states" or some sort of LED feedback that allows you to select an LED color for pads/touch buttons/etc that you've set to toggle or fixed velocity. That would be really nice because then I could actually have a nice LED feedback color for my toggle-esque pads indicating a note off instead of just having the pad go dark when it's in Note Off. Anyways, thanks for your help Mark! Excited to set everything else up for my show coming up in a couple of weeks! Just as an FYI, Live doesn't send MIDI feedback when a device is turned on and off, which is why a MIDI learned action will not light up when it is toggled. Toggle mode with hypothetically fix this, but could screw up some of your other lighting functions as toggle is a global option. Well, the LED feedback seems to work when toggle is disabled in the editor for those pads. As long as I'm not using the remote script, and I have toggle disabled for the pads I want, if I map a pad to a device On/Off I seem to get LED feedback on the Base. The problem now is trying to get the BASE to transmit successfully on a different channel than ch.1. I've tried setting the global MIDI channel to like, 15 or 16, and then I enabled "Use Settings Ch" in the editor, saved to the device, re-opened Live, but for some reason, whenever I use MIDI learn it still seems to transmit MIDI on channel 1, which interferes with the LED feedback from my APC40 knobs and faders which are also transmitting on that channel. No matter how many times I try to enable the global channel in the editor, it always seems to be transmitting on ch.1. Am I doing something wrong or misunderstanding something here? You only need to change the ch. setting for the bank 1. Having some trouble with this again. It seems like it started happening after I upgraded the firmware for my BASE I, I was able to resolve this issue at one point in time for a long time. It also could very well be an issue stemming from an update from Ableton perhaps? Not sure. Anyways, I've attached a screenshot of some MIDI feedback from me pressing pad 1 a few times. I have it set to toggle, I have CCs turned off, Fixed Note Velocity turned on, and Note Mode on. I'm on Ch.16 as well. Now whenever I have a device added onto a track in Live, I go to map the "On/Off" button of the device to my pad, I get nothing. Once in a blue moon, I'll see a very short flicker of LED response on the BASE and a very short flicker of the device being turned on in Live, but it never stays toggled to "On". Before, when this was working, I could map this pad to a device's "On/Off" button, and it would toggle the device on and the pad would light up green, then once I hit the pad again, it would toggle off, and the pad would go blank. Is there a way to achieve the same thing since the pad is sending to note values of 127/on and 0/off? Hey Moon, thanks for the reply! Okay, so I've turned off toggle for pretty much all pads as well as for the individual pads (I think it works that way? ), and pretty much everything else is the same. Fixed Velocity is left on, Note Output is left on, and CCs are enabled. I still get the same issue in Live, however for some reason.. I remembered in the past there was a way to map the on/off switch with a pad outputting note values by entering MIDI Map mode in Live, hitting and holding the pad I want mapped, while holding it press the pad next to it, let go of that pad, then let go of the pad I want to map. That used to work, but now when I try that, it still acts as a momentary effect once it's mapped. Should I still be mapping it this way or should I be able to map the pad by just pressing it once? Either way, still seem to be getting the same issue. Hopefully it's not something faulty with the BASE itself. BTW, I'm running Live 9.1.7 Suite. Hey Moon, thanks again for your reply. I finally was able to get it working. I think there were some other MIDI ports that were enabled in my Preferences that were possibly interfering with my mappings for the Base. The only issue now is that I don't get actual LED feedback on the Base whereas I used to before. Any ideas on that? There we go, just needed to enable "Remote" on my MIDI Output like you said and that did the trick! Thanks again!